Visual Artists soon learn the dominant role of composition and design in art. Photography is a fast way to explore these principles. The rectangular eye of the camera is used to select an interesting scene which may contain an interesting part or parts. Traditionally artists use a small subdivided frame through which to view a part of the larger landscape. Others have mentally memorized the artist's window and apply it to the scene using their imaginations. Some modern cameras come with a visual grid that may be turned on or off. Nature it seems needs some type of human organizing in order to turn it into a work of art. We may use my following experience to show how relevant organizing your thoughts are to the creation of art. I listened to a talk show caller this morning. The callers spoke a few words paused sputtered then a few more words, paused sputtered. I stopped listening because the speaker had no smooth flow. The speaker's emotional excitement was so extreeme as to push through the mind's ability to compose the thoughts into a smooth expression of ideas. We have all encountered someone like that. Controlling and shaping the emotion into a smooth expression is the art. Knowing what colour shapes to select and which to exaggerate, which to subordinate and which to diminish are the skills necessary to shape your personal expression with tranquility, (some may like more expression), grace and confidence. How do I develop the feeling of what is of artistic interest? A writer interprets the world into words. A painter interprets whe world into colour and shape. The musician interprets the world into sounds. The writer reads great works. The painter views great art. The musician listens to great music. The photographer looks at great art and great photographs - not junk! It is the consuming of great works that develops your sense of art as a system of relationships constructed by each artist. During our two weeks in New York City I picked up a book from Barnes & Noble titled: The Contents of Visual Experience by, Susanna Siegel, Oxford University Press, 2012. She presents the philosophical argument that the contents of perception are "rich" in that they go beyond the presentation of colour, shape, illumination, motion, and space to contain the content of being. She refers to this as the "rich content view". Applying her concepts to my photography resulted in combining a photograph with a short interpretive essay that illustrates how content is added to the image. The image and text merge to become my : "Rich Content Photography" process. Secret street art depends upon extracting sections of my photographs to magnify small jewel like segments of life and in the process giving context to those fleeting momentary images that pass through each one of us. The rectangularity of the litter can reflects the rectangularity of the frame. The tonal pattern of her clothing reflects the litter can tonality. 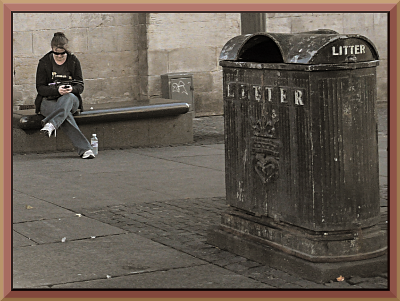 They become pictorially joined to express the inside world of both the very casually dressed woman reading printed words as the grungy litter container that silently observes her. They are a group of two. She becomes a reflection of her inner world escaping the indifferent outer world through the consumption of words. She contains the book's words through thoughts. 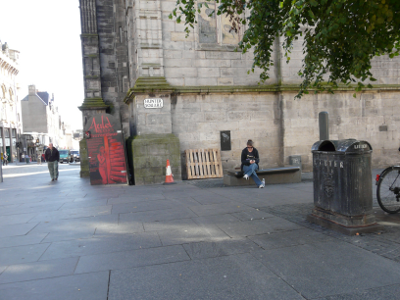 Litter contains the tossed printed words and waste from passers-by. Each contains aspects of the other through the form of containers. Together they form a quiet timeless partnership frozen in pictorial space and time. An old woman with cane is shown in the first hip shot photo. She proudly wears her Girl Guides pin. 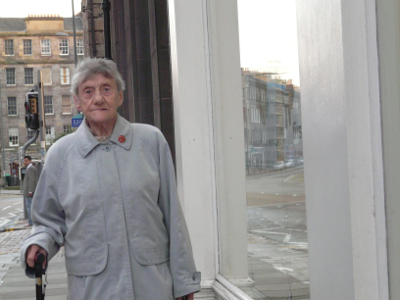 Old enough to have served with the Girl Guides first aid volunteer group during World War Two. Girl Guides were the first civilian first aid group allowed into Auschwitz at the war's end to help the suffering and bear witness to man's inhumanity to man. 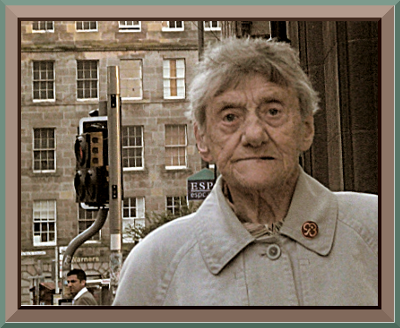 Her aged face, disheveled hair, unstable gait and steady gaze exhibit a silent narrative of never to be shared memories. The Girl Guides earned their place in history for their valued service during the war. A place of honor was given to them in the annual memorial day Remembrance Day parade of November 11. I only noticed the pin and its possible significance during my graphic processing. My wife , a long time Girl Guide, verfied my thought that it was indeed a British Girl Guide Pin. There was something in her gesture that made her stand out among my thousands of photographs. I am happy she found her way into my camera. I am happy to have found her image. I wanted her head and shoulders rugged and set against the stone building in the background. To me she was like those old stone buildings still surviving. The modern trafic light system and younger men reflect the change over her lifetime. Something about a relationship between the windows in the old stone building and her eyes. I sometimes wonder if she is looking at me or am I looking into her window-like eyes only to find a darkened room. She becomes at some level united with the old stone buildings. As my gaze moves back and forth between her and the stone buildings I begin to feel like I am looking at an organic form of stone. This scene struck me as a birth metaphor. We enter this world starting from a womb-container traveling down a soft flexable tunnel, then suddenly pushed out from a warm fluid world into a dry chilly world. 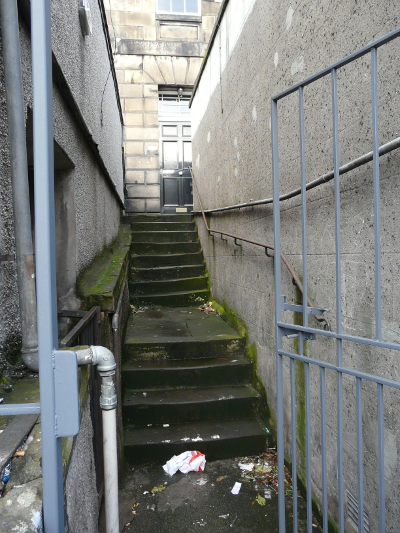 The stairs in the photograph nestle in a darkish grungy tunnel-like valley, sprinkled here and there with bits of garbage. 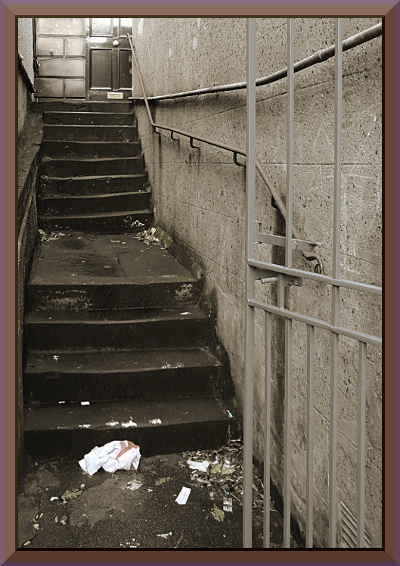 It does not give the impression of a cozy journey towards the upper door which may be used to symbolize adulthood.The photograph becomes a metaphore for a tough childhood that may lack care and understanding. The photograph is a symbolized path of a difficult journey from birth through childhood into adulthood. The jail-like open gate feels like the entrance into a prison where one must do time. It also recognizes the probability that some of our adult behavour is related to both childhood experiences and inherited genetic factors.